How to Butterfly (Spatchcock) a Whole Chicken. An increasingly popular way to prepare chicken that can be grilled or roasting in the oven. When butterflied (or spatchcocked), a chicken cooks up quickly and develops a delicious crispy skin. If you’ve watched a cooking show on TV (Food Network or Cooking Channel), chances are you’ve seen a chef preparing a chicken in this manner. Butterfly chicken, also known as spatchcock, which refers to the chicken when the backbone is removed is not a difficult thing to do. I’m going to give you an easy, step-by-step tutorial because I know you’ll want to try this. I use this method all the time as the chicken roasts in half the time. Last holiday season, I even spatchcocked a turkey with amazing results. You can scroll down this post to see the recipes I’ve made using this method. Just 3 items are needed. 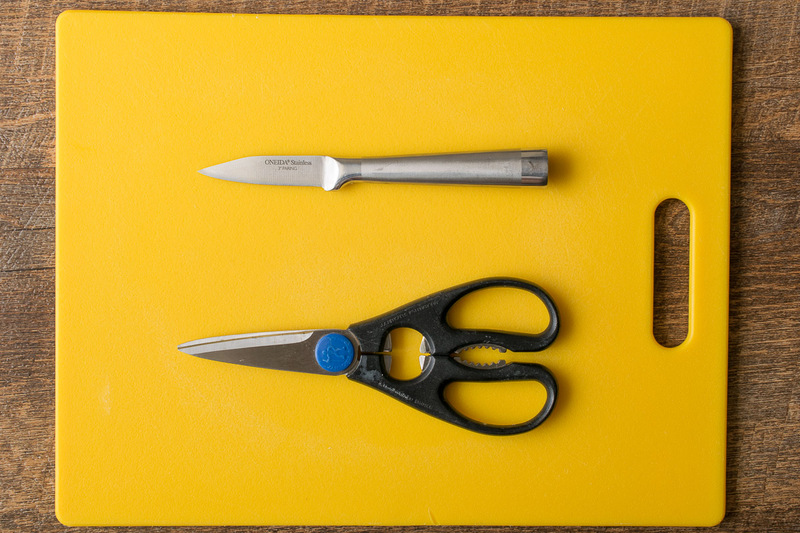 A sturdy cutting board, a sharp pairing knife and sharp kitchen shears. With the bird breast-side down and the open end of the bird closest to you, grab the end of the backbone. Using the shears, cut down either side of the backbone and remove. 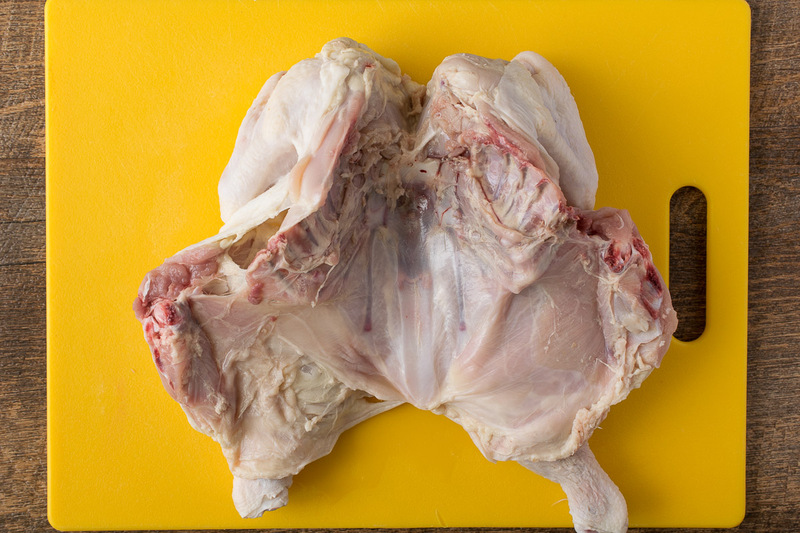 Once the backbone is removed, open up the chicken with the legs closest to you (sorry, it’s not the prettiest of pictures). There’s a soft, white, almost transparent piece of cartilage down the center that joins a bone. The best way to remove this is to cut either side so you can grab a hold of it and then cut around it. Just keep cutting away fat around it and pulling. 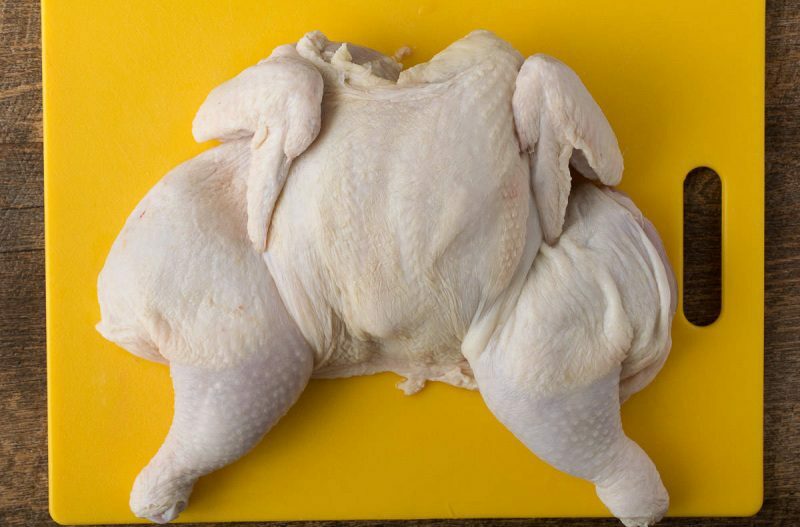 Flip the chicken over skin side up and with the palm of your hand, press down on the center to flatten the bird. You may hear a pop. The chicken is ready to be cooked whole, but if you want, you can cut the bird in half to portion it out. To do this, use a large chef’s knife and cut down the center. 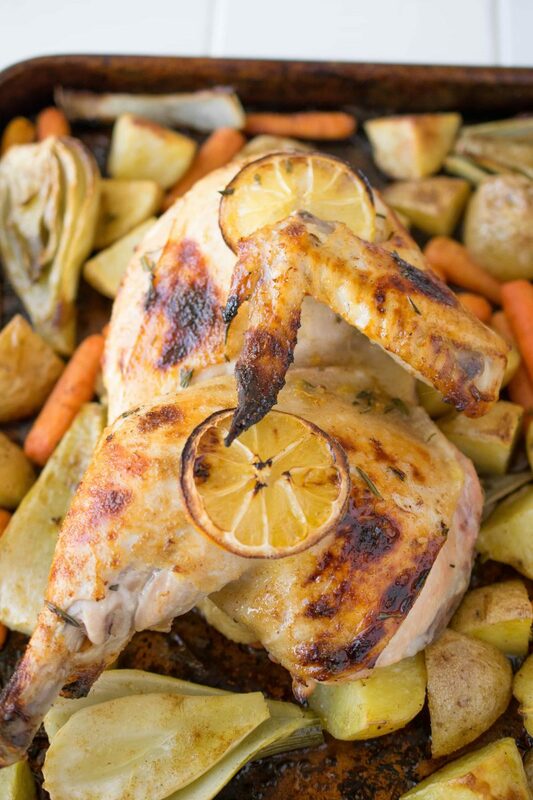 Sheet Pan Roasted Chicken & Vegetables. 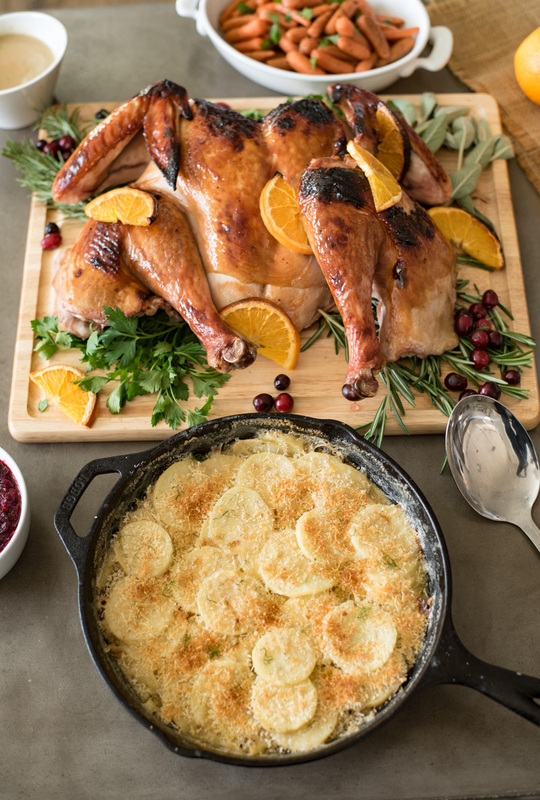 For the holidays, you need to try this Spatchcock Cranberry Orange Glazed Turkey, which was a huge hit last year. If you’ve tried this method of How to Butterfly (Spatchcock) a Whole Chicken or any other recipe on the blog then don’t forget to rate the recipe and let me know how you got on in the comments below. I love to hear from my readers! You can also FOLLOW ME on FACEBOOK, TWITTER, INSTAGRAMand PINTEREST to see daily recipe updates. There's a soft, white, almost transparent piece of cartilage down the center that joins a bone. The best way to remove this is to cut either side so you can grab a hold of it and then cut around it. Just keep cutting away fat around it and pulling. 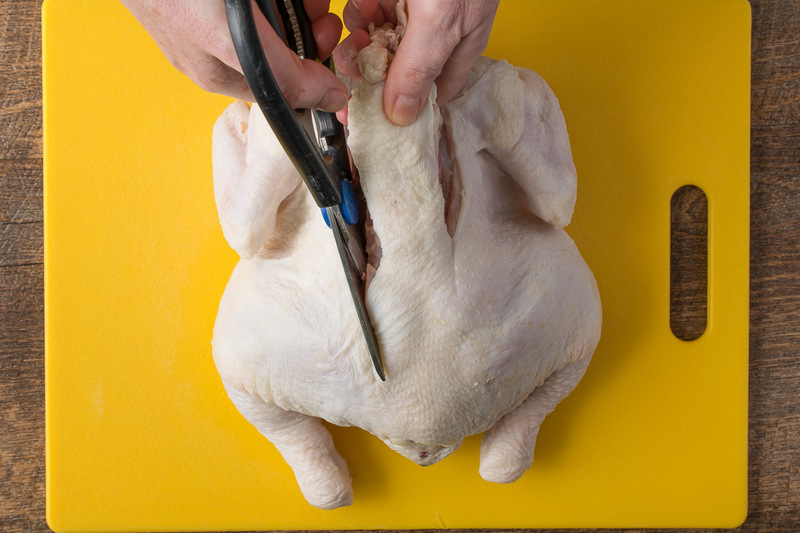 The chicken is ready to be cooked whole, but if you want, you can cut the bird in half to portion it out. To do this, use a large chef's knife and cut down the center. This looks beautiful. Now I know how to deal with the whole CHICKEN. I used to use a big knife to cut the chicken, I would like to try the way you use, thank you for the information. My son did this a yr ago with a turkey. Came out juicy and crispy. Time needed to cook was decreased by a lot. I love that it speeds up the cooking. Thanks for stopping by. We are having Cornish Hens in a wild rice casserole for Thanksgiving. 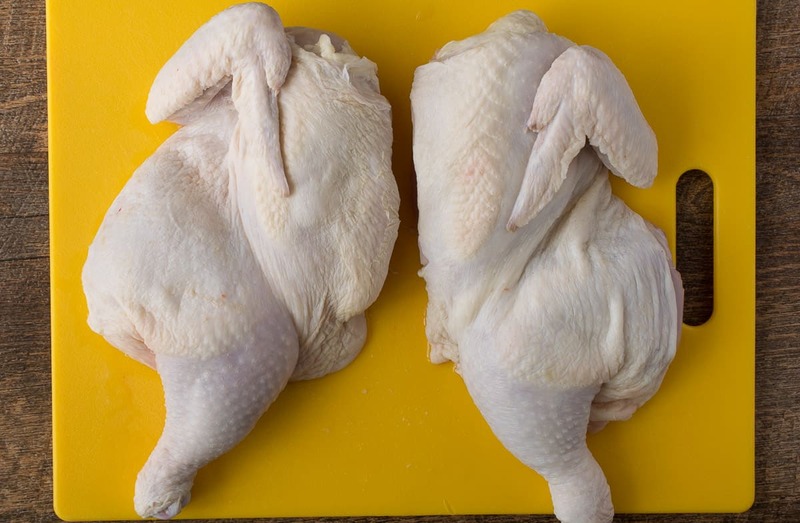 Instead of cutting up the hen’s in pieces and putting them in the casserole, I am going to use your way of spatchkocking them, and cutting them in half and they will not only look beautiful, in larger pieces, but maybe get a bit crisper. Can’t wait to try it, will let you know how they turned out. Thanks for sharing. This sounds like a delicious Thanksgiving dinner, I love your idea. I’ve used this method many times. Great on the grill. And it cooks quickly! Easy! You’re welcome Frankie and thank you for stopping by with your nice comment. I followed these directions. Not hard at all. Mine worked perfectly. In 5 minutes, my chicken was butterflied and ready for seasoning. This was a simple to the point instructional! Thank you!! I have been wanting to prepare a whole chicken in this manner, so I really appreciate this step-by-step tutorial. Thanks, Janette! What a great tutorial Janette! 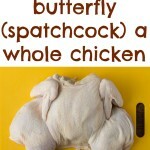 I always ask the butcher at Whole Foods to butterfly my chickens, but now I’m determined to try this myself! I’ve still never spatchcocked anything, but I want to try. This will give me the confidence I need to give it a whirl! This is a great tutorial! 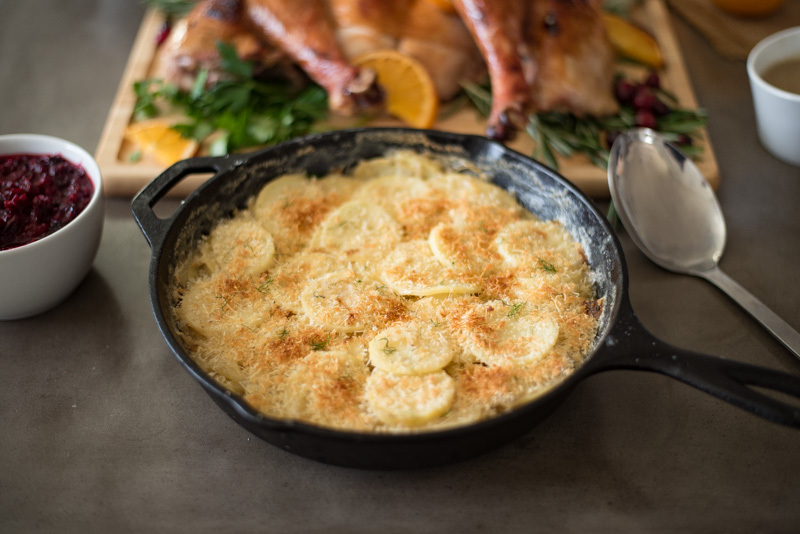 I pretty much only use butterflied chickens for roasting—so perfectly, evenly cooked and crispy! I think it’s a lost art, we are all so used to just picking up chicken at the grocery store. Great step by step! LOVE this post; we are big fans of grilled chicken and look forward to using this technique for our birds! I have never had to Butterfly a chicken, but, if I ever need to in the future, I know where to go for instructions. You explain the process very well.